Space exploration on your mobile device can become more exciting if the gameplay is immersive and engaging. 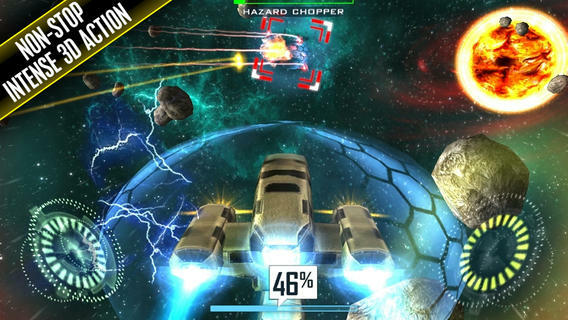 Fortunately, there are some excellent iPhone games that let you explore the universe, fight . Games like Waking Mars and Star Command are examples of good titles for your phone of tablet PC. Some are on-rails shooters that let you blast enemy ships, while others allow you to explore the depths of the universe. Here’s a rundown of the best iOS space games that let you command your fleet and dominate the virtual universe. 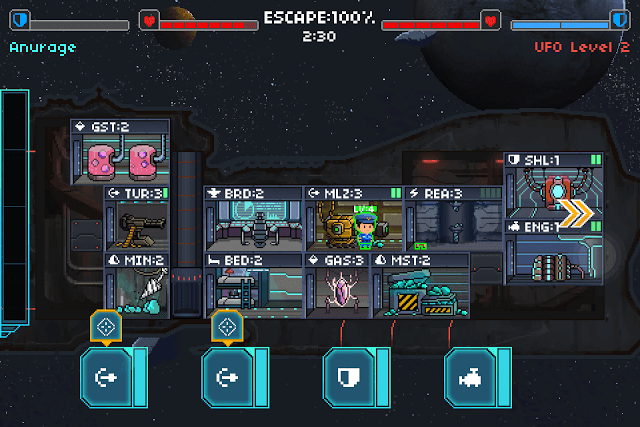 Pixel Starships is a Fallout-shelter like game . This spaceship management game lets you construct different types of rooms, such as weapons room, reactor room, engine rooms and bedrooms, assign crew members to them and build a powerful ship that can withstand attacks from enemy starships. if you want to know more about Pixel Starships, read this guide. The game’s PvP battles are fun and extremely rewarding. You can engage with random players online, destroy their starships and earn resources that will help you build a better and stronger ship. Optimizing rooms is crucial for your ship’s survival and you may need plenty of resources to upgrade them. Managing your starship and upgrading rooms play an important role in space battles. The game’s 8-bit space battles are impressive. The screen shakes when your spaceship gets hit or attacks an enemy ship. You zoom in to futuristic looking starship to peek into each room. Stunning pixel-art is a nice throwback to the good old NES days. If you love retro-style games and are fond of space-themed games, then you should download Pixel Starships. Waking Mars is a space exploration game that revolves around the adventures of a team of scientists who are tasked to explore and collect samples from the red planet. The game lets you explore a strange Martian cave system full of interesting life-forms, including a fascinating plant species called the Zoa. It offers a mix of platforming, puzzle and exploration and has an interesting storyline that branches into multiple endings in the final stage. Puzzles revolve around the Martian ecosystem and biomass and are cleverly laid out to keep players busy for hours. 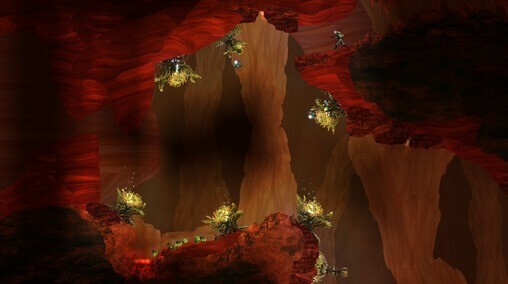 The mystery around Zoa, the Martian cavern and other elements can be unearthed once you reach the last level. Since the game has multiple endings, you might want to save it before playing one more time to find another plot twist. Waking Mars recreates the Martian exploration scenario with its excellent 2D graphics and plenty of physics-based puzzles. If you are fascinated by the red planet then you must try it out. A space shooter game, Frontier lets you take control of a space station, mine resources from asteroids and shoot down any incoming alien warships that threaten your ship’s survival. The space station, called Phoenix Prospector, can be upgraded with new weapons and turned into a badass battle station. You need to place the weapons and defense equipment in the right areas to make sure enemy ships don’t infiltrate your territory. Frontier’s game mechanics is similar to a tower defense game, but it is played on space. You will also need to place several mechanical miners at the end of the space station’s “tentacles” to expedite mining at nearby asteroids. The space station looks like a giant mechanical octopus mining raw materials and destroying alien ships at the same time. Space Station: Frontier has an easy learning curve, but it will be difficult to master all levels. A must-buy, if you love playing tower defense games. Star Armada is a real-time strategy game that takes place in deep, dark space. Instead of land vehicles, you will be commanding space ships. At first you will have a basic set of ships, ranging from battle cruisers to destroyers. As you progress, you will be given an opportunity to upgrade your ships and make them more powerful. Along with a set of ships, you will also command a shipyard where all the weapon upgrades take place. Through this interface, you can upgrade ships from choosing different types of weapons, such as lasers and shock cannons. Each weapon type has its own advantages and disadvantages, so choose the weapon type wisely. Laser inflicts less damage, but can rip apart an enemy unit’s shields. Pulse cannons can fire at a faster rate than other weapons, but is not as accurate as, say, laser. Besides ship upgrades, you can concentrate on others structures to strengthen your defenses. You will be able to build defensive structures as well as a variety of important buildings like research house and resource collectors. Like a typical RTS, the game focuses on resource collection. You will also be building additional special structures like nuclear missile super weapon. 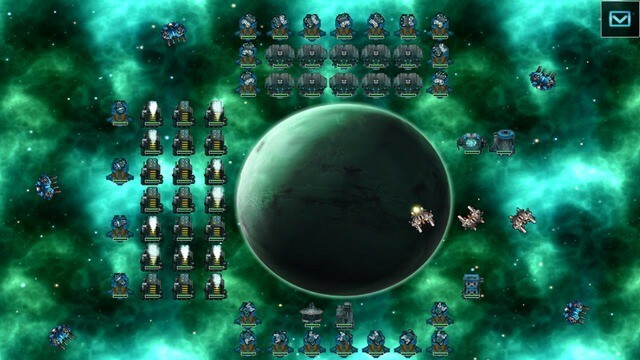 Star Armada is a brilliant iOS space RTS game with plenty of customization options. There are different types of maps and a variety of modes, ranging from easy to brutal. AI tactics is impressive and ship customization is deep. A must-buy if you have enjoyed games like Star Trek: Armada, although the 2000 RTS is light years ahead when it comes to real-time strategy. Asteroid mining can be fun, especially when you have to command a space ship and explore the depths of space right from your mobile device. Space Miner will let you do that. The objective is to mine raw materials from asteroids, but things won’t be easy as you will be stalked by the forces of a powerful and corrupt corporation whose eyes are on the raw materials. It’s a battle for ore and whoever survives will dominate the asteroid fields. The game lets players blast asteroids and mine ore by extracting contents to their ship. Mining resources has its own advantages as it raises a player’s XP, giving him access to ship upgrades and new map locations for mining more asteroids. Later, you will encounter enemy ships that will try to stop your ship from mining ores. You will need to have upgraded weapons to blast enemies and collect ore. The game’s virtual wheel lets you control your ship whereas your ship’s thruster buttons controls its speed. You can manually open fire at enemies by pressing the shoot buttons or can switch to auto mode for continuous firing. The game’s upgrade system lets you choose a ship and upgrade its parts with the credit you’ve earned while mining. Space Miner is a good space shooting game. It has a good control system and plenty of unlockable content. It’s the perfect arcade experience I have been looking for and I am sure you too will agree with me. Quantum Legacy is an out-and-out space shooter where players blast bad guys and activate their craft’s shields to protect it. The game’s presentation is amazing, and has gorgeous backgrounds. The ship design is marvelous and everything from laser beams to explosion look good on your iPhone screen. As far as the plot goes, Quantum Legacy doesn’t have a complete storyline. You won’t be able to know the character background. Gameplay revolves around attacking enemy ships, while putting on your shields to avoid getting hit. Timing is important as you will need to shoot at your enemy ships when they lower their shields. The game has 20 odd missions, and completing each mission will give you a chance to upgrade your ship with new shield types and weapons. Quantum Legacy will appeal to shooter fans, but will get a bit repetitive and boring at later stages. Developers could have added a bit more variety, especially in the AI ship department. All in all, it’s a good game, visually very impressive and has nice tilt-based controls. Star Command is an excellent space exploration game that lets you manage your ship as you explore the universe seeking new life forms. It’s a pocket-sized Star Trek for your iOS device and although it does not pass off completely as a space simulator, it does offer some elements that allow you to take the captain’s role; command a team of scientists, researchers and soldiers and manage your ship. 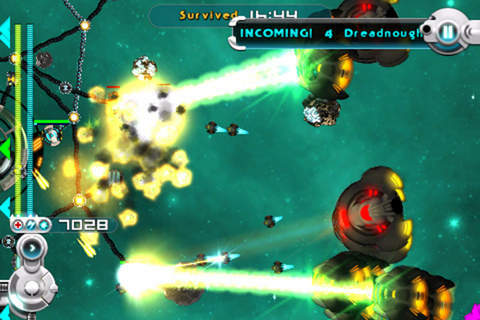 The game offers a mini-tutorial mode that explains the ins and outs of the game, including managing the ship, crew-assembling and space combat. Star Command also has a dialogue mode that lets you choose an option from a list of few choices. Choosing an option will determine the outcome of a situation. Combat plays an important part in this game. You will be fighting red units that have infiltrated your ship and use your ship’s weapons to blast rival space ship. Crew members play a key role in gameplay. Without a crew member in the weapon’s area of the ship, you cannot beam your lasers at enemy ships. Along with ship-to-ship combat, there’s fast-paced intense on-board combat. The real-time battles can be paused in between, giving you some time to get your troops ready for another assault session. The game has unique pixel art graphics, which really ups the play value. Even with the pixel art, there is greater attention to detail (example: spaceship). The funky Star Trek-like objects within a room of a space ship are beautifully designed. 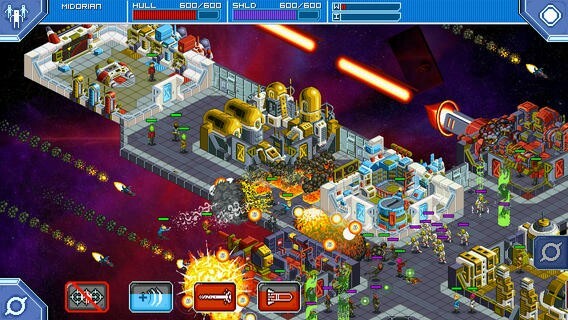 Star Command is a good solid space game on iPhone. The game doesn’t offer a deep space simulator experience, but offers plenty of fun moments to keep you busy for hours.